Poetry Friday - A review of Let's Celebrate! Since I moved to America, I have learned about and experienced all kinds of holidays that I did not know about when I was a child. I have celebrated Cinco de Mayo, Halloween, Hanukkah, Diwali, and Chinese New Year with friends and family, and I have greatly enjoyed every single festive occasion. Today's picture book looks at twenty-four holidays from around the world, some of which might be new to you. There is a good chance that somewhere in the world, at this moment, people are celebrating a festival day. There are so many holidays that many of us have never even heard of, and many that we are aware exist but that we nothing about. For this colorful poetry collection, the editors have selected twenty-nine poems that celebrate a variety of festive days that are celebrated in countries around the world. Children and their families are sure to enjoy the pictures and poems in this special book. The poems were written by poets from around the world, and some are modern, while others are older. Most were written in English, but a few were written in other languages and were translated for us. At the back of the book, readers will find brief explanations of the twenty-four holidays that are mentioned in the book. In our house, my husband is the one who really loves hot and spicy food. He used to spice up the food I cooked when it was in the pot. He has since learned that this is not such a good idea, and he spices up his meals at the table instead with a dash of hot sauce here, and a pinch of cayenne power there. Today's fiction title is a chapter book that tells the story of two friends who try to cook a meal together and who encounter a problem. Pinch is hungry, and he fancies having a bowl of soup to eat. He looks in his refrigerator and sees that it contains a potato, some spinach, and some cheese, but he does not feel like making some soup himself because he is feeling lazy. He is also feeling too lazy to walk down to the Chat and Chew restaurant to get a bowl of soup. There is only one solution to this problem; Pinch is going to visit his friend Dash because Dash is always cooking something delicious. Sure enough, when Pinch arrives at Dash’s house, Dash is in his kitchen and he is cooking something. Dash explains that he is making skinny soup, in other words, “soup with not much in it.” Dash invites Pinch to join him, which is exactly what Pinch wants to do. There is a problem though. Dash’s soup is a bit too skinny. It needs to be “fattened up.” Pinch offers to go to his house to get the potato that is sitting in his fridge. When it is clear that one potato has not quite done the trick, Pinch gets the spinach, and then he gets the cheese from his house. Now the soup is sufficiently “fat,” but Pinch feels it is lacking seasoning. Dash refuses to let Pinch put any pepper or hot sauce into the soup, and the friends squabble about who has the right to season the soup. This amusing young reader’s chapter book not only contains an humorous story, but it also explores the idea that sometimes you have to make compromises for the sake of your friends. Children will chuckle when they see what lazy Dash does to get the kind of soup that he wants. Children like to think that they are the only people who can have secrets that are fun and interesting. They never imagine that their grownups might have "cool" secrets of their own, because grownups and the word "cool" simply do not go together. This picture book shows to great effect that there are times when grownups can be pretty interesting people, and it is not wise to underestimate them. Oh, and you will also get to meet a rather clever penguin in this story, which I am sure will delight readers who have a soft spot for penguins. Elliot is a not your average kind of boy. He wears a neat suit black suit, a white shirt, and a black bow tie. He does not enjoy the usual pursuits popular with children, so when he father suggest going to the Family Fun Day at the aquarium, Elliott agrees to go more out of politeness than anything else. At the aquarium, Elliot eschews the exhibits that attract all the other children, and instead he wonders off on his own. Which is when he finds the penguins. He loves the way the Magellan penguins look with their “tidy black feather tuxedos” and their “proper posture,” so he goes to where his father is sitting and asks if he can have a penguin. His father gives Elliott a twenty-dollar bill, and then Elliot goes to the penguin enclosure and picks out the smallest penguin. Eliott’s father thinks that his son is going to buy a toy penguin in the gift shop, and it never occurs to him that Elliott has a real penguin in his backpack when they leave the aquarium. Taking care of an animal that is used to cold temperatures, ice, and lots of water is not an easy thing to do when you live in a house. Especially when you are not too keen to let your father know that there is a penguin in residence. Elliott and his penguin, Magellan, manage very well for a while, and then the unthinkable happens. Children will laugh out loud when they see how Elliott acquires his unusual pet, and when they then see what he does to take care of it. They will love the extremely surprising ending, and will enjoy going back through the book to find the clues that suggest that Elliott’s father might have a secret of his own. With a beautifully written and minimal text, and David Small’s wonderfully expressive illustrations, this is a picture book that readers of all ages will enjoy reading. Anyone who has a fondness for penguins must add this title to their penguin book library. Can you imagine what an animal would look like if it had the body of a bumblebee, and the head, paws, and tail of a beaver? No, neither could I until I read today's poetry title. Perhaps imagining such a thing does not interest you. Why would anyone want to waste their time imagining such an animal? Well, I can tell you from personal experience that seeing what a Bumblebeaver looks like is not a waste of time at all. Don't believe me? Then look through this book and you will see for yourself. On its pages you will meet some very strange looking creatures, and you will read some wonderful poems that will make you smile, or maybe even laugh. Professor Julius Duckworth O'Hare (Esquire) is a zoologist who likes to travel around the world to study rare and peculiar creatures the like of which most of us have never heard of. We are very lucky because Kenyon Cox and Wallace Edwards have combined their considerable talents to introduce us just some of the bizarre animals that the Professor saw on his travels. Be advised that some of these creatures are rather startling to look at, but I am sure that you will be intrigued by them. Perhaps the most interesting of the animals in this book is the octopussycat. Though it is not cuddly, it is certainly fascinating because each its eight arms can work independently. The Bumblebeaver is another curious creature. It is able to make "mud-houses with his tail / Or gather honey with his nose." If you think that that is peculiar, then you should see a Creampuffin. This animal is half bird, and half dessert, and can in fact can be eaten in its 'raw' form. This picture book of delightfully ridiculous verse introduces readers to thirteen highly unlikely looking animals, each one of which is shown in a very unusual setting. The verse is lively and rhyming, reminiscent of some of the verse found in the Alice in Wonderland books. When readers investigate the illustrations closely they will find that other peculiar creatures inhabit the artwork. These animals are shown in an illustrated listing in the back of the book. Readers will also discover one last surprise on the very last page of the book, one which will go a long way to explain who (and what) Professor Julius Duckworth O'Hare is. I know that countless American children have grown up listening to, and then reading, the Ramona books. Unfortunately, I was not able to have this experience. For some reason the books in this superlative series never crossed the Atlantic. I cannot imagine why they were not available in Europe when I was growing up, but they weren't. I moved to the U.S. in 1991, and soon after I met Ramona for the first time. Despite my adult status, I love the Ramona stories, and I know I would have loved then when I was a child too. Just in case there are some of you who have somehow missed reading about Ramona and her family, here is a review of the first title in the collection. As her little sister finds endless ways to make her life miserable, Beezus finds herself getting angry again and again. Even worse, she discovers that there are moments when she really does not like her little sister at all. There are times when she wishes she could have a break from Ramona. Does this mean that she is a bad person and a bad sister? Any child who has been around an annoying younger brother, sister, cousin, or friend will appreciate the six stories in this book. The problems that Beezus and Ramona have to deal with are of the everyday variety; they are the kind of problems that children can relate to. At the same time they are also funny and highly entertaining. This is the first title in a series of books about Ramona Quimby. The Hans Christian Andersen Award Jury of the International Board on Books for Young People (IBBY) announces that María Teresa Andruetto from Argentina is the winner of the 2012 Hans Christian Andersen Author Award and Peter Sís from the Czech Republic is the winner of the 2012 Hans Christian Andersen Illustrator Award. The Andersen medals and diplomas will be presented to the winners at the international IBBY congress in London, United Kingdom on Saturday, 25 August 2012. The Hans Christian Andersen Award, considered the most prestigious in international children’s literature, is given biennially by the International Board on Books for Young People to a living author and illustrator whose complete works are judged to have made lasting contributions to children's literature. In awarding the 2012 Hans Christian Andersen Medal for writing to María Teresa Andruetto the Jury recognises her mastery in writing important and original works that are strongly focussed on aesthetics. She creates sensitive books, which are deep and poetic with a clear literary base. Her books relate to a great variety of topics, such as migration, inner worlds, injustice, love, poverty, violence or political affairs. Andruetto was selected from 27 authors nominated for the Award. The four finalists are Paul Fleischman (USA), Bart Moeyaert (Belgium), Jean-Claude Mourlevat (France) and Bianca Pitzorno (Italy). In awarding the 2012 Hans Christian Andersen Medal for illustration to Peter Sís the Jury recognizes his extraordinary originality and deep creative power to relate highly complex stories that can be interpreted on many different levels. The jury particularly appreciates his use of different design and artistic techniques, as well as his innovative approach using a subtle balance to depict well-documented and historical events and fantastic elements. The other author candidates were Christobel Mattingley (Australia), Monika Pelz (Austria), Bartolomeu Campos de Queirós (Brazil), Tim Wynne-Jones (Canada), Elli Peonidou (Cyprus), Lene Kaaberbøl (Denmark), Sinikka Nopola/Tiina Nopola (Finland), Paul Maar (Germany), Christos Boulotis (Greece), Eoin Colfer (Ireland), Masamoto Nasu (Japan), Hwang Sun-mi (Republic of Korea), Tonke Dragt (Netherlands), Bjørn Sortland (Norway), Silvia Kerim (Romania), Ljubivoje Ršumovic (Serbia), Tone Pavcek (Slovenia), Agustín Fernández Paz (Spain), Lennart Hellsing (Sweden), Franz Hohler (Switzerland), Sevim Ak (Turkey), and Philip Pullman (UK). The other illustrator candidates were Pablo Bernasconi (Argentina), Bob Graham (Australia), Renate Habinger (Austria), Louis Joos (Belgium), Stéphane Jorisch (Canada), Charlotte Pardi (Denmark), Virpi Talvitie (Finland), Henri Galeron (France), Rotraut Susanne Berner (Germany), Efie Lada (Greece), Francesco Tullio-Altan (Italy), Satoshi Kako (Japan), Hong Seong-Chan (Republic of Korea), Anita Paegle (Latvia), Annemarie van Haeringen (Netherlands), Øyvind Torseter (Norway), Valeria Moldovan (Romania), Gennadij Spirin (Russia), Dobrosav Živkovic (Serbia), Alenka Sottler (Slovenia), Anna-Clara Tidholm (Sweden), Kathrin Schärer (Switzerland), Feridun Oral (Turkey), Chris Raschka (USA) and Arnal Ballester (Venezuela). The ten members of the 2012 Jury, led by Jury President María Jesús Gil from Spain, met in Basel, Switzerland on 10 and 11 March 2012. The Jury of children's literature experts comprised Anastasia Arkhipova (Russia), Françoise Ballenger (France), Ernest Bond (USA), Sabine Fuchs (Austria), Ayfer Gürdal Ünal (Turkey), Jan Hansson (Sweden), Eva Kaliskami (Greece), Nora Lía Sormani (Argentina), Sahar Tarhandeh (Iran) and Regina Zilberman (Brazil). Elda Nogueira from Brazil representing IBBY and Liz Page as Jury Secretary attended the meeting ex officio. Some time ago, I started working as a learning-to-read volunteer. I find this work to be incredibly rewarding, and I have met some wonderful children. When they make a breakthrough, or figure out how to sound out a difficult word, their pride in their accomplishment is a priceless gift. Today's picture book is about a little girl cat called Yoko who is learning how to read. The book is one in a series of picture books about Yoko written and illustrated by Rosemary Wells. Rosemary is a fantastic writer who has given us Max and Ruby, Timothy, McDuff, and many other wonderful book characters. Every evening, Yoko and her mother read one of the three Japanese children’s books that they own, and now Yoko knows the stories in the books by heart. As a reward for knowing the stories, Yoko’s teacher, Mrs. Jenkins, lets Yoko put three leaves on the class book tree. Yoko cannot help noticing that Valerie has four leaves on the tree, and Angelo has six leaves. Yoko wants to be able to put more leaves on the tree because she does not want to be “left behind.” The problem is that Yoko only has the three Japanese books at home, and she needs to read new books if she wants to get more leaves. Yoko and her Mama decide to go the library so that they can borrow books for Yoko. When they get home, they are able to figure out the story in the book by looking at the pictures, but they still cannot read the words. Yoko is still learning how, and Yoko’s mama only knows how to read Japanese words. Somehow, Yoko needs to learn how to read the words in her library books so that she can earn more leaves. When you are young, learning how to read can be challenging, especially if your parents don’t know how to read, or if they only know how to read words that are written in a foreign language. In this charming picture book, Rosemary wells brings back Yoko, her little Japanese kitten character, to show children that anyone can learn how to read if they have a little help. In just a few days, spring will officially have arrived. Of course, you may still be experiencing cold weather on the day, but at least you can start thinking about spring, and anticipating the warmer weather, the opening flowers, and the little leaves budding out on the trees. Today's poetry book uses a very unique format to describe the experiences of one little girl who very much wants spring to arrive. 2012 Children's Choice Book Awards - VOTE! It is time to vote for the Children's Choice Book Awards! You can do this online on the Children's Book Week Voting Page. There are six categories: Kindergarten to Second Grade Book of the Year; Third to Fourth Grade Book of the Year; Fifth to Sixth Grade Book of the Year; Teen Book of the Year; Author of the Year; Illustrator of the Year. You can find out more about the finalists here. "The Children's Choice Book Awards is the only national book awards program where the winning titles are selected by children and teens of all ages. Launched in 2008 by the Children's Book Council and Every Child A Reader (The CBC Foundation), The Children’s Choice Book Awards program was created to provide young readers with an opportunity to voice their opinions about the books being written for them and to help develop a reading list that will motivate children to read more and cultivate a love of reading. Voting will open March 14, 2012. The winners will be announced live at the Children's Choice Book Awards gala in New York City. Finalist Selection ProcessThe finalists for Book of the Year in the Kindergarten to Second Grade, Third Grade to Fourth Grade, and Fifth Grade to Sixth Grade categories are the books that received the highest number of votes in the IRA-CBC Children's Choices program. Children's Choices, a joint project of the International Reading Association (IRA) and the CBC, began in 1974. Teams of IRA-affiliated educators in five geographic regions receive copies of each submitted title to provide to students to read and rate in classrooms across their region. The votes from the five regions (from approximately 12,500 children) are compiled and the five titles with the highest number of votes in each category (K-2, 3-4, 5-6) become the finalists for the Children's Choice Book Awards. The Teen Choice Book Award was added in 2009. The Teen Choice finalists are determined with the help ofTeenreads.com (part of The Book Report Network). The website compiles a list of all the books they have reviewed over the year and encourages readers to write in their own picks if they aren't listed. Teens vote for their favorite book and the top five vote-getters become the finalists for the Teen Choice Book of the Year. This year, over 4,000 teens determined the finalists. The Author and Illustrator of the Year finalists are selected by the CBC from a review of bestseller lists with an emphasis on Bookscan. Only authors and illustrators associated with books published in the previous calendar year are considered. " I will be honest with you. I really don't care for Westerns. Not in story form, and not in film form. For this reason, I was reluctant to review today's fiction title. Then I read the blurb on the back of the book, and I was intrigued. I am so glad that I was open-minded enough to start reading the book, because once I had started, I could not put it down. It is September 26, 1862, and P.K. Pinkerton comes home to find out that his foster father is dead, and his foster mother is dying. Lying on the floor and knowing that she will soon be in heaven, Ma Evangeline tells P.K. that the three men who attacked then are looking for the little medicine bag that P.K’s Indian mother gave him. P.K. manages to retrieve the bag and hide himself before the three killers return, and he hears them talking about him. While he waits for the stagecoach to arrive, (P.K. knows that he needs to get far away as soon as possible) he reads a piece of paper that he finds in his medicine bag. Though he is not sure what it is exactly, he does appreciate that the paper is very valuable, and that anyone who owns it will be very rich indeed. Some hours later P.K arrives in Virginia City. One of the bigger mining towns in Nevada Territory, Virginia City is a hotbed of vice. Here there are opium dens, houses of ill repute, and saloons. There are gamblers, “Soiled Doves,” criminals, and men who think nothing of shooting first and asking questions later. P.K. isn’t in Virginia City long before he is robbed by a “Soiled Dove” of everything valuable that he owns (including the piece of paper.) He soon comes to understand that in Virginia City the rule is everyone for himself (or herself.) He cannot trust anyone to look out for his interests. A newspaperman called Sam Clements who has recently arrived in the area takes pity on P.K. Sam does his best to help the boy, but the three desperados who are seeking him out are never far behind, and P.K. begins to despair that he will ever be able to escape their clutches. In this very unusual and highly entertaining western, Caroline Lawrence combines fact and fiction to give readers a singular story and a colorful picture of what it was like to be in a mining town in the late 1800’s. Readers will soon get caught up in P.K’s extraordinary tale, and they will appreciate the strategies he adopts to survive, some of which are very odd indeed. Every so often I encounter a book that I think has something to say to anyone (of any age) who reads it. Today's title is just such a book. It delighted and inspired me, and I plan on always keeping it on hand for those days when I need to be reminded that there is nothing wrong with being a novice artist, a novice violinist, or a novice anything else. It is better to be a novice than to never begin at all. Not long ago, Dog, who loves books, opened up a bookshop. He has a happy life sharing books with others and reading books by himself. Then one day he gets a parcel, and inside the parcel Dog finds a book that is completely blank. What on earth is one supposed to do with a book that has no words or pictures in it? Then Dog reads a note that his Aunt Dora wrote on the inside cover of the book. In the note she says that she hopes that “the line you draw” will “open a door to some wonderful adventures.” Now some of us would find this note confusing, but Dog understands what Aunt Dora means. The book is for drawing in! Dog quickly sets about getting pens, brushes, pencils, and the other things he is going to need. Then he draws a door…and walks through it and onto the blank page in his sketch book. The first thing Dog does is to draw a stickman to be his friend, and together Dog and the stickman doodle away until the page is filled up. They turn the page, and decide to draw some more companions, and soon a duck, owl, and a crab are on the page as well, happily paintings and doodling with Dog’s art supplies. One the next page, the friends decide that it is time for them to “go on an outing.” Luckyily for them, they can draw anything they need so that they can go on an adventure. For some lucky people, drawing comes as naturally as walking or eating. The rest of us have to explore a little before we feel comfortable with a pencil or paintbrush in our hands. This splendid book will show anyone who is unsure about how to start drawing that the only thing to do is to start drawing and to see where it takes you. Dog’s easy confidence, even though he is not an artist, is infectious, and readers are likely to find, when they have finished the story, that they too would like to have an adventure on a blank page. Though this book is about Dog’s drawing adventure, the message in the tale could apply to any of the many adventures that people embark on in life. None of us really know how to do things at first. We all have to explore and practice before we properly know what we are doing. Readers who enjoyed this book will want to read the first Dog book, Dog Loves Books. I review a lot of books. A lot. Much as I would like to put all my favorites titles on my shelves, this just isn't possible because my house isn't big enough. So, I have to be selective. I have to be very very choosy. Today's poetry book is one of the titles that I have on my books-to-dip-into shelf. Looking at the pages is rather like having a feast. I can explore the extraordinary art, AND and I can read the poetry. If I need a lift there is something here to cheer me up, and when I need to be soothed, there are several poems in the collection that are very comforting and calming. This really is the kind of book that you can grow old with. When Jella Lepman founded the International Board on Books for Young People (IBBY) she hoped that books could be used to help children all over the world to recover from wars and other catastrophic events. She hoped too that books would unite children from different countries and thus help people of different nationalities, races, and creeds to get along better. Though Jella Lepman is not longer with us to continue her work, her dream lives on. In celebration of the art used in children's literature and to raise money for IBBY, illustrators from all over the world have contributed their artwork for this book. which they have paired with poems that they love. On the pages of this beautiful and special book readers will find the work of, among others, Peter Sis, Quentin Blake, Anno, Marie-Louise Gay, Eva Eriksson, Philippe Dumas, and Anthony Browne. The poems and songs which accompany the art are funny or moving, or contemplative. Some of the pieces rhyme, and some are written in blank verse. A wide variety of subjects is explored in the poetry, and many of the poems are traditional, though some were written by the artist. Where the illustrator is from a non-English speaking country, the poems and songs are written both in their native language and in English. In some cases the script is, in itself, beautiful to look at. 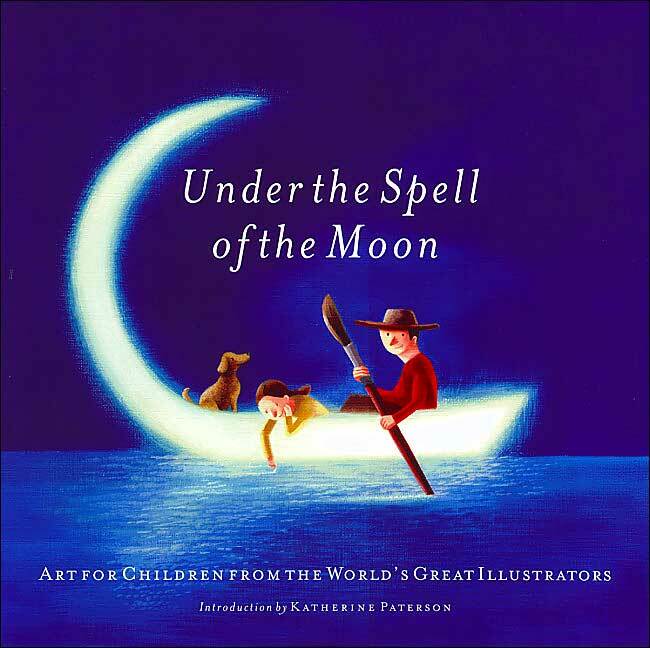 This book would make a wonderful gift for a child, but it would also delight anyone who has a love of the written word and children's book illustration. A letter from Shirin Yim Bridges about her press, Goosebottom Books. March is Women's History Month, and in honor of this celebration of women I asked Shirin Yim Bridges to tell me about the two new series that Goosebottom Books has released. She didn’t know, but she was very interested. So, we went looking in bookstores and libraries for these stories. I knew the princesses were out there, because I’m a history nerd, but I was surprised to find that these tales were not being told for children. I decided that I would have to tell them. At first, I was just going to write the books. Then I realized how important it was to me how the stories were told. I’d been a creative director in advertising for...longer than I’m going to confess…and I wanted to have creative control of these books. I wanted the main stories to be as lyrical as any storybook, but I wanted this narrative supported by lots of little details that bring the story to life. So, in our books you’ll always find a map showing you where our woman from history lived. There’s always a section on what she wore. There’s also a fun section on what she ate. And, in addition to the main illustrations of the story, every page is covered with artifacts and historical images that add to the text. Even the backgrounds and colors of each book have something to do with the period of history we’re talking about. To me, six real princesses appearing all at once tells a very different story from one real princess...and then maybe another...and another, over time. It says that you’re looking at a pattern, not an isolated incidence. And whether good or bad (because yes, some of the dastardly dames were bad), the pattern is that women have been an important part of history throughout time. Women have, against greater odds than we can imagine, asserted themselves and made their mark in different countries, different cultures, and different periods of history. And this fact is simply not reflected on our bookshelves. Goosebottom Books aims to change that, and aims to make the discovery of these women fun. Here’s to a future full of thinking girls and even more women making history! And, thank you for your interest in Goosebottom Books. The Thinking Girls Treasury of Dastardly Dames has been selected as a "Top Ten Nonfiction Series for Youth" and will be featured in the April 1st Series Nonfiction Issue of Booklist! The Thinking Girl’s Treasury of Real Princesses won a medal at the 2011 IPPY Awards for Multicultural Non-fiction/Juvenile. Two books in the series, Hatshepsut of Egypt and Isabella of Castile, have been named on the Amelia Bloomer Project 2012 List of Recommended Feminist Books for Youth. Many of the fiction titles that I read when I was between the ages of 8 and 12 were wonderful, but very few of them were what I would call amusing. In the last ten years or so, a number of mid-grade novels written using a diary/journal format have been published. I am a huge fan of these titles because the format allows the authors to really get inside their characters, and to write in their voices, complete with spelling mistakes. Often the resulting narrative is both interesting and funny. Today's fiction title is a great example of this kind of book. Clarice Bean has a problem. Actually, she has several problems. At home, she has to share her bedroom with her five-year-old brother, which is very trying indeed. At school, she has to deal with her teacher, Mrs. Wilberton, who thinks that Clarice is “utterly lacking in the concentration department.” Clarice does her best, but she cannot help it when her thoughts wonder away when Mrs. Wilberton is speaking. One day, Clarice’s thoughts are drifting away, as per usual, when she is brought firmly into the present by an announcement about the forthcoming parent’s night competition. This year the students are going to have to do a presentation that is based on a book that they have read “and learned something from.” How dreary. Try as they might, Clarice and her best friend (and project partner) Betty Moody cannot come up with any ideas. One day soon after this announcement is made, on a day when Betty is absent from school, Clarice is forced to come up with a project idea all by herself. Not knowing what else to say, Clarice tells her teacher that she and Betty are going to do an exhibit on Ruby Redfort, a book character who is a secret agent. Clarice and Betty love the Ruby Redfort books, but Mrs. Wilberton thinks that they are “drivel.” Clarice has been paired up with Karl Wrenbury (the class hooligan) because Betty is still absent, and she cannot imagine that they are going to be able to produce much of anything, let alone a competition winning exhibit. At first, Karl is reluctant to have anything to do with Ruby Redfort and her splendid adventures, but then he sees the errors of his ways and he comes up with some splendid ideas. Maybe Clarice and Karl will be able to create an exhibit that is not altogether terrible. If nothing else goes wrong. Which is sure to happen because it always does. Written in Clarice Bean’s own singular voice, this wonderfully funny title perfectly captures Clarice Bean’s quirky and highly imaginative personality. We follow her everyday adventures closely as she tries to survive problems she encounters at home and at school. Will Clarice be back soon? Hopefully she will. Some of the characters that you meet in picture books seem to come alive as you read about their exploits and adventures. Imagine what it would be like if they could really leave the page in their book and walk into our world. What would it be like for them and what would they do? If you have ever thought about this kind of thing (which I confess I have) then you are going to love this book. Prepare to meet Otto, the book bear. Otto is a bear who lives in a book, and he loves it when children read his story. What the children don’t know is that Otto is able to come to life and leave the pages of his book when he wants to. When no one is around to see what he is up to, Otto goes exploring. He also reads books and practices writing. Then one day something unthinkable happens. Otto’s family moves away, and Otto’s book, with Otto in it of course, gets left behind. Otto is not the kind of bear to feel sorry for himself, so he leaves the house and goes out into the wide world. In this deliciously sweet picture book, we meet a delightful book character who is appealing, and whose story will touch the hearts of every reader who encounters him. Young readers will, in all likelihood, never feel the same way about picture book characters after they meet Otto. 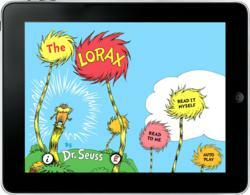 Oceanhouse Media is offering low price and free Dr. Seuss apps. Oceanhouse Media, Inc. has announced that it will drop the price of The Lorax omBook (Oceanhouse Media digital book) to 99 cents and offer the Lorax Garden game for free from March 2nd through 8th in honor of Dr. Seuss’s birthday and Read Across America Day. In addition, 25 Dr. Seuss omBooks will be on sale ranging in price from 99 cents to $2.99 on iOS and Android markets. The National Education Association’s Read Across America is an annual reading motivation and awareness program that calls for every child in every community to celebrate reading on March 2, the birthday of beloved children’s author Dr. Seuss. The omBooks feature three options: Auto Play (geared toward younger readers), which plays like a movie by automatically reading and turning pages; Read To Me, which allows users to listen to the narrated story with words highlighted as they are read; and Read It Myself, which lets users read the book in its traditional format. Dr. Seuss omBooks are consistently ranked at the top of the app charts, with nine reaching the number one spot in the Books category on Apple’s App Store. Recent releases include If I Ran the Zoo and And to Think That I Saw It on Mulberry Street, Dr. Seuss’s first children’s book. For a list of Dr. Seuss omBooks on sale for the birthday celebration, visit the Oceanhouse Media website starting March 2 athttp://www.oceanhousemedia.com/products/type/sale/drseuss/. In addition to Lorax Garden, Dr. Seuss Band, the Dr. Seuss musical instrument game, is also available for free. Creators of the award-winning Dr. Seuss book apps, Oceanhouse Media, Inc. is a leading publisher of more than 300 mobile apps for iOS (iPhone, iPad, iPod Touch), Android, NOOK Color, NOOK Tablet, Kindle Fire and HP TouchPad devices. The company was founded in early 2009 by Michel Kripalani, a veteran of the video gaming industry. Seventeen of the company’s apps have reached the number one spot within their categories on Apple’s App Store. In addition, Google has selected the company as one of its Top Developers, a designation granted to only 150 groups worldwide. Oceanhouse Media's corporate focus is to uplift, educate and inspire through technology. For more information, visit http://www.oceanhousemedia.com. Follow the company at http://www.facebook.com/OceanhouseMedia andhttp://twitter.com/OceanhouseMedia. About Dr. Seuss Enterprise, L.P.
Dr. Seuss Enterprises was founded in 1993 following the death of Theodor S. Geisel, Dr. Seuss, to conserve and nurture the works of Dr. Seuss by protecting the integrity of the Dr. Seuss books while expanding beyond books into licensed merchandise. The licensing effort is a strategic part of the overall effort to strengthen and protect the relationship consumers have with Dr. Seuss characters. Theodor Geisel said he never wanted to license his characters to anyone who would “round out the edges”. That is one of the guiding philosophies of Dr. Seuss Enterprises. When I first met my husband, he had a T-shirt that was more hole than fabric. He loved that shirt, and would not consider for a moment that perhaps it was time to retire the poor thing. Eventually, I put the shirt away in his treasure box, and every so often he finds it there and reminisces about the adventures that he and his shirt shared. My husband's attachment to his shirt is not unusual, and people all over the world treasure items of clothing that they associate with special people or memorable times. Today's poetry collection will resonate with anyone who has had an item of clothing that they remember fondly. Clothes are just clothes right? They cover us up and keep us warm. And yet, many of us have certain clothes that are special. We have a lucky shirt that we wear when we have a test or a race to run. We have a worn sweater that someone we loved knitted for us, and we insist on wearing the sweater until it falls apart. This amusing collection of poems tells the story of some special clothes, and they are written from the point of view of the clothes themselves. Each item of clothing belongs to a young animal, and each one has a story to tell. We meet Violet’s hiking hat. A pink chapeau with ear flaps and a bill, the hat shares many adventures with Violet, going on hikes, looking at the stars, having baths, and even going to bed with her. These outspoken undies are not the only ones who are proud of their status in life. There are also Joshua’s jammies, who declare very firmly that they are not “jammies for penguins” or any other animals. They are jammies that belong to Joshua, and Joshua alone. By the by, just in case you are curious, Joshua is a young alligator. These wonderful poems will delight young readers who have certain items of clothing that have sentimental value. Children will enjoy looking at the cunning pictures of the animal wearing their clothes, and they will laugh at the funny things the clothes say about the people they belong to. Although the Geisels enjoyed great financial success for many years, the onset of World War I and Prohibition presented both financial and social challenges for the German immigrants. Nonetheless, the family persevered and again prospered, providing Ted and his sister, Marnie, with happy childhoods. The influence of Ted's memories of Springfield can be seen throughout his work. Drawings of Horton the Elephant meandering along streams in the Jungle of Nool, for example, mirror the watercourses in Springfield's Forest Park from the period. The fanciful truck driven by Sylvester McMonkey McBean in The Sneetches could well be the Knox tractor that young Ted saw on the streets of Springfield. In addition to its name, Ted's first children's book, And To Think That I Saw It On Mulberry Street, is filled with Springfield imagery, including a look-alike of Mayor Fordis Parker on the reviewing stand, and police officers riding red motorcycles, the traditional color of Springfield's famed Indian Motocycles. Ted left Springfield as a teenager to attend Dartmouth College, where he became editor-in-chief of the Jack-O-Lantern, Dartmouth's humor magazine. 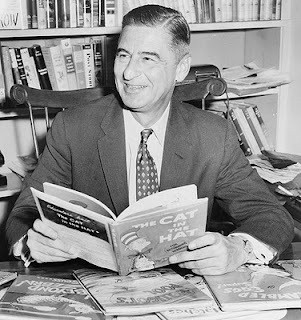 Although his tenure as editor ended prematurely when Ted and his friends were caught throwing a drinking party, which was against the prohibition laws and school policy, he continued to contribute to the magazine, signing his work "Seuss." This is the first record of the "Seuss" pseudonym, which was both Ted's middle name and his mother's maiden name. To please his father, who wanted him to be a college professor, Ted went on to Oxford University in England after graduation. However, his academic studies bored him, and he decided to tour Europe instead. Oxford did provide him the opportunity to meet a classmate, Helen Palmer, who not only became his first wife, but also a children's author and book editor. After returning to the United States, Ted began to pursue a career as a cartoonist. The Saturday Evening Post and other publications published some of his early pieces, but the bulk of Ted's activity during his early career was devoted to creating advertising campaigns for Standard Oil, which he did for more than 15 years. As World War II approached, Ted's focus shifted, and he began contributing weekly political cartoons to PM magazine, a liberal publication. Too old for the draft, but wanting to contribute to the war effort, Ted served with Frank Capra's Signal Corps (U.S. Army) making training movies. It was here that he was introduced to the art of animation and developed a series of animated training films featuring a trainee called Private Snafu. While Ted was continuing to contribute to Life, Vanity Fair, Judge and other magazines, Viking Press offered him a contract to illustrate a collection of children's sayings called Boners. 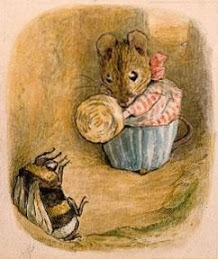 Although the book was not a commercial success, the illustrations received great reviews, providing Ted with his first "big break" into children's literature. Getting the first book that he both wrote and illustrated, And to Think That I Saw It on Mulberry Street, published, however, required a great degree of persistence - it was rejected 27 times before being published by Vanguard Press. The Cat in the Hat, perhaps the defining book of Ted's career, developed as part of a unique joint venture between Houghton Mifflin (Vanguard Press) and Random House. Houghton Mifflin asked Ted to write and illustrate a children's primer using only 225 "new-reader" vocabulary words. Because he was under contract to Random House, Random House obtained the trade publication rights, and Houghton Mifflin kept the school rights. With the release of The Cat in the Hat, Ted became the definitive children's book author and illustrator. After Ted's first wife died in 1967, Ted married an old friend, Audrey Stone Geisel, who not only influenced his later books, but now guards his legacy as the president of Dr. Seuss Enterprises. At the time of his death on September 24, 1991, Ted had written and illustrated 44 children's books, including such all-time favorites as Green Eggs and Ham, Oh, the Places You'll Go, Fox in Socks, and How the Grinch Stole Christmas. His books had been translated into more than 15 languages. Over 200 million copies had found their way into homes and hearts around the world. Besides the books, his works have provided the source for eleven children's television specials, a Broadway musical and a feature-length motion picture. Other major motion pictures are on the way. Please visit the Seussville website to learn more about Dr. Seuss, to explore his books, to play games, and to download Seuss-ish goodies. In honor of Dr. Seuss, March 2nd is Read Across America Day. Get information about this event on NEA's Read Across America webpage. Please visit the TTLG Dr. Seuss page to find reviews of books by and about Dr. Seuss. The 2012 Golden Kite Award Winners have been announced! The 2012 awards are presented for excellence in books for young readers published in the 2011 calendar year. Between Shades of Gray tells the harrowing story of Lina, a young Lithuanian girl fighting for her life and the honor of her family during the Soviet cleansing of the Baltic region in 1941. The daughter of a Lithuanian refugee herself, Sepetys wrote this book in hopes of shedding light on the hundreds of thousands of people who lost their lives during this tragic time. Readers will be inspired by Lina’s strength of spirit and devotion to her family and moved by Sepetys’ heartfelt gift for storytelling. Exploring the enchanted lives of animals that survive winter underground, Kate Messner’s Over and Under the Snow is this year’s winner for Picture Book Text. Messner’s vivid imageries and delicate prose glide us along a whimsical journey of a father and son as they ski through the forest and discover the hidden, sometimes secret existence of the animals that inhabit the cold season. Melissa Sweet’s imaginative use of art and illustration in Balloons over Broadway makes it the winner of this year’s Golden Kite Award for Picture Book Illustration. Using handmade toys and puppets, watercolor illustrations, and collages made from old books, found objects and fabrics, Caldecott Honoree Sweet’s charming images are fluently united to help tell the story of Tony Sarg, the original puppeteer of the Macy’s Day Parade. The Golden Kite Awards and Honors are given each year to the most outstanding children’s books published during the previous year, and written or illustrated by members of the Society of Children’s Book Writers and Illustrators. Four panels of three judges each (one panel for each category, consisting of author or illustrator members of SCBWI whose own works are that of the category being judged), award the titles they feel exhibit excellence in writing or illustration, and that genuinely appeal to the interests and concerns of children. A list of previous Golden Kite Award winners and honor books is available here. Named for the late Newbery-winner Sid Fleischman the SCBWI is pleased to offer this eponymous award for authors whose work exemplifies excellence in the genre of humor, a category so often overlooked by other award committees in children’s literature. The Golden Kite Awards and the Sid Fleischman Award for Humor are presented at the Golden Kite Luncheon, the centerpiece event of SCBWI’s 41st Annual Conference on Writing and Illustrating for Children, taking place in Los Angeles, California from August 3-6, 2012., will be presented to the winners on Sunday, August 5. The new issue of TTLG is now online.